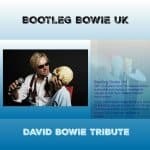 Bootleg Bowie UK (aka Nick) is a fantastic tribute to the awesome David Bowie. This highly entertaining one man show has been performed all over the UK and Ireland. He also performed in the recently refurbished Savoy Hotel in London to A-list celebrities and fashion artists and Bootleg Bowie featured in an episode of ‘Don’t Tell The Bride’. The episode has been regularly repeated on the Freesat channels with the show covering all Bowie’s classic hits from the 70s and 80s. It includes a live acoustic version of the classic ‘Space Oddity’. Costume is taken from more recent times and is usually a black waist coat with pocket watch chain. Sound system is versatile and compact yet powerful enough to suit most small to medium sized venues and minimalistic stage lighting is used to enhance the performance. Show format is available as 2 x 35 min, 2 x 45 min or 1 x 60 min set – subject to budget. Previous clients & venues include: The Savoy Hotel London, Raddison Blu Waterfront Jersey, Sandhurst Military Academy, O2 Academy Manchester, Tie Silk Restaurant London O2, Finnstown House Hotel Ireland, G-Casino Ricoh Arena Coventry, Silverlake Stadium Eastleigh and Haven Holidays. Space Oddity, Modern Love, The Man Who Sold the World, Absolute Beginners, Ziggy Stardust, Heroes, Suffragette City, Young Americans, Changes, Under Pressure, Starman, Underground, The Jean Genie, All The Young Dudes. Drive In Saturday, Blue Jean, Rebel Rebel, Dancing In the Streets, Boys Keep Swinging, 20th Century Boy, Knock On Wood, Rock n Roll Suicide, Oh You Pretty Things, Life On Mars, Hang On To Yourself, Sorrow, Golden Years, Fame, Fashion, Ashes to Ashes, Let’s Dance, China Girl, Scary Monsters, As The World Falls Down, Wild Is The Wind. “Hi Nick, Just a quick note to say thank you so much for your performance on Saturday at Beckenham. It was a real pleasure to work with you & your sound guy (sorry forgot his name). I have had loads of positive feedback from the event. If anybody asks me about a David Bowie tribute you will be very much recommended. I look forward to working with you again soon.” Travis, Entertainments Director, Beckenham Market on the Green and Heritage Trail. “To Nick (+ sound guy) Thank you so much for your performance at my Dads 55th birthday at the Taswell Arms (Portsmouth). Everybody has said how brilliant you were & how they had a great night. Hope to see you again somewhere.” Carly Tong, Birthday Party, Portsmouth. Nick, Thank you so much for making our wedding reception so fantastic. We are both now real Bowie fans!! I’m sure we will come and watch you again soon. Kerry & Saxon, wedding. “Nick played at my 40th party. His Bowie act was superb, the way he performed Bowie through the years was brilliant. Everyone was up dancing and singing along to all his classic numbers. I would definitely recommend Nick’s act to anyone who is a Bowie fan, all round great entertainment.” Chrissy Burgess, 40th Party.